I’ve read quite a few of the British Library Crime Classics and enjoyed their beautiful covers, but The Murder of My Aunt is the first that has been darkly comic. Edward sees himself as fashionable and too good for the sleepy Welsh village of Llwll where he lives with his aunt. His aunt supports him but not well enough for him to live in London and indulge himself. Edward is not a nice person, but he turns malicious after his aunt pulls a prank to get him to walk into the village instead of driving his car, La Joyeuse. He decides to murder her to get control of his life and her fortune. Indeed, if we are to believe Edward’s version, his aunt is not much more likable than he is. But are we to believe him? The novel is very entertaining until it bogs down a bit with a change of narrators. 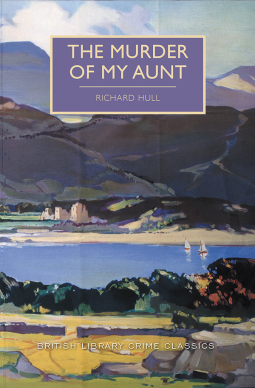 The Murder of My Aunt was considered a genre breaker in its time and was praised for its freshness and originality. Certainly, I found Edward’s machinations amusing, but the barbs directed at his effeminate nature are also mean-spirited. Previous Article Best Book of Five! I read this recently too and enjoyed it, though I still need to write my review. I haven’t read as many of the British Library Crime Classics as you have, but I think this is my favourite so far. It’s one of the good ones. whatmeread on Classics Club Spin #20! piningforthewest on Classics Club Spin #20! Jessie on Classics Club Spin #20! Helen on Classics Club Spin #20! Cathy746books on Classics Club Spin #20! Book reviews and bookish-related articles. I read a lot of books. Reviews of books...and occasional other stuff.